Things don't just change on a daily basis. They change on an hourly basis. We will just add as things do change and you can just scroll down. We intend to continue this on an "as things change" basis until we give them back. This little guy gives real meaning to the word "potential." I confess that when I first met him (or her) I thought it looked a lot like a baby buzzard. I knew that all baby birds look sort of ugly if you just take them the way they are. Even the beautiful ones start out that way. Some just take longer to develop their beauty. If the story of the Ugly Duckling is playing in your head, you are not alone. If you are wondering how we came to be so lucky as to have four new playthings, I will explain that. Four people who we hold to be very special are taking a Christmas cruise. We have the great pleasure of feeding this flock while they are gone and it has, indeed, been a pleasure. When we first agreed to take on that job we did not know it but one of this group will stay with us when their family returns. I really think they wanted to give Sally a bird but knew she wouldn't take it as a gift. Pretty smart. Enough of that. Lets get back to generalities. There are a lot of things we do not know about these little critters. To start with for half of them we do not know if they are boys or girls. The root of the eclectus name is eclectic. They are not all the same. That comes from the extreme difference in the male/female coloring. The girls turn red with some blue or purple and the boys turn green with possibly some splashes of red. There are others like wikipedia.com, but this is written so that even I can understand. This is the first real clue we saw as to whether this little guy was boy or girl. One of the other ones has a red sheen to its head. Two of them are uncertain. The two getting her red and his green-tipped feathers are also the largest and best coordinated. Supposedly the girls are more aggressive at stages than the boys. Since ours will probably become an only child, we don't really care what it is. I am very used to our prior parrots thinking that Sally is the best person ever and that I am a "chew toy." I think they were both boys and I heard that boys bond better to female owners. That isn't something that I would want to bet on but I do have a little story from the other side of the spectrum. When Sally and I met, I had a Cockatiel named Woodrow P. Wilcox. I just called him "Woody," and he and I were best of friends. I would take him everywhere on my shoulder. Except for the increased laundry load, that did not make any problems. Then one day Woody began to lay eggs and I had to change her name to "Woodrina." Just made that name right up out of thin air. I had her for a number of years and she survived my sons teen years by some miracle. That went right along with the theory that opposite sexes attract. Below is the same wing 48 hours later. Same wing after 48 hours. Green busting out all over the place. This would be the aforementioned best person in the world (Sally) who will henceforth (sometimes) be referred to as the "parrot whisperer." We once bought a quaker parrot (sometimes called a monk parakeet) and it was a member of our home for about 10 years. We also inherited a type of African grey that loved to mimic the microwave and other things. He barked and meowed which confused our dogs. Both of these birds picked last year to depart this earth leaving our home with empty cages and hearts. Then along came this little flock. Before we lose them, I will try to point out how baby birds can have different personalities and you can see why we make our choice. Once again Sally is doing the work and I am playing, so I guess she will make the choice. The little green in the wing that you see above is starting to explode. 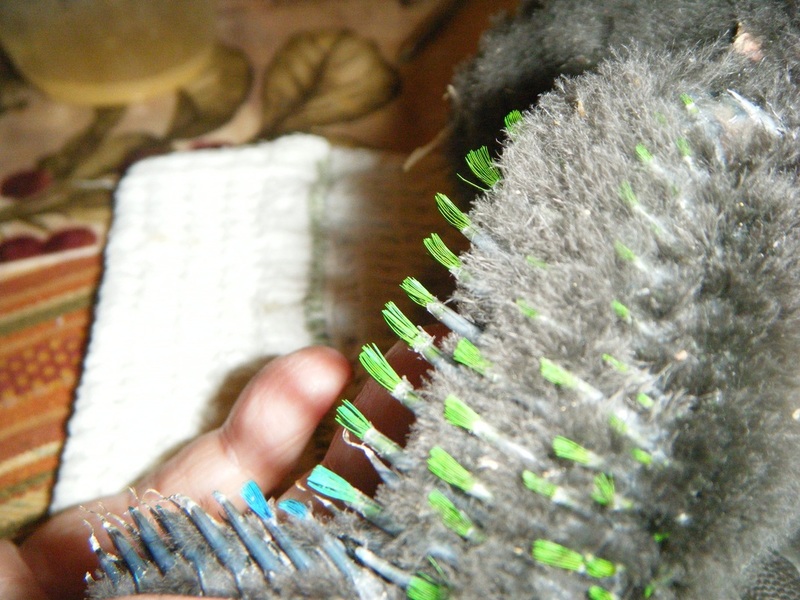 Twenty-four hours later and more green feathers are starting to break out. We have two that haven’t yet announced their gender. From what I can see in various pictures the male is going to be larger than the female. We know that one of the flock at our home is a female. She is the same size as the one that we know is a male. She is four weeks older. The three younger birds are probably three weeks old. These birds were not really domesticated in the United States until the 1980's so nobody is really sure how old they can get. One site said probably thirty years old. Another had a pair that was 30 that still reproduced. I think the jury is still out but I would expect it is a lot longer than 30. Some parrots live to be over 100. I think our baby will outlive us. For the purposes of working with them (and because we wanted to) all of them got a name today. This guy who is apparently going to develop faster than the other two young ones is named Greengo. He is really friendly and a voracious eater. He is now about the same size as the female that is four weeks older. It is easy to see the green popping out from other areas on his wing. You can only see a hint of it on the side of his face in the picture but in person (or is that in parrot) it is very pronounced. Yesterday it was not. Really, it is just everywhere today. Ruby is four weeks older than the others but two of them are almost her size. You can see Greengo and Ruby here. Obviously they are developing their coloration in different stages. He with feathers sticking out all over. She has feathers as well but her head is the area of most prominent development. There is also less contrast with the red feathers so they are harder to see. The side of her head almost looks like she is bleeding. Nearness makes the one on the left look largest but he is not. That is Chuy and he turned out to be a she. Ruby who is the second one is the largest, maybe. Chuy is so named because he chews the straw that feeds him. He will also chew very ineffectively on your finger if you let him. Coming in as number three here is Sleepy who would rather sleep than eat most of the time. When sleepy is engaged he shows proper development compared to the others. Sleepy finally showed some green feathers which means my theory on size holds no water. The linked site above says that by the time they are weaned at four months they can frequently speak a word if that word has been repeated often by the feeder. If so, Ruby may be saying "Gimme Kiss" when we are done feeding. She talks to us now when we incite her but it probably is not what it seems. One site described these talking symptoms as those of a bird with stunted development and not enough food. We fed her some more and she stopped squawking. 12/26/12: I think we have had them for five days now and there is a tremendous difference. Note the color in this picture. I edited it just a little bit to make the color stand out. Five days ago I could have edited all I wanted and would have had no reward for my efforts. This little lady is Ruby and she is the oldest of the babies and does not look the part. She does act the part. Although she is not bigger she is more coordinated and active. She responds to affection and is really capturing us. The littlest one of the bunch is also very affectionate. He has yet to show any color like the other three. I don't have a clue if his growth will catch up. May not know before we have to give him back. This is Ruby again. The picture is not edited. You can see red blotches on the head and just the start of the red feathers on the wing. There was nothing there 2 days ago. Green stuff popping out all over the place. You have seen the feathers on the trailing edge and now they are popping out spontaneously in several places. If you look closely there is the hint of a green sheen on the top of his head. The wingspan of an eagle (in his mind). This little guy is the main challenge for dominance to Ruby. We just saw the first red pinfeather on number three, Chuy and nothing yet on number four, Sleepy. One thing I can be sure of is that tomorrow will show us something different and unexpected. In all the pictures of pairs that I have seen the female is smaller than the male. That really means very little because our little flock is showing it doesn't have to be that way. 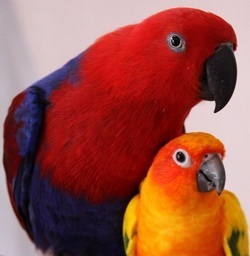 This is an Eclectus female and a Sun Conure. Our Congo was an African Gray and I feel the eclectus will be just a little larger than him. If you have seen the Conure in a pet store this should give you a better perspective. Not a lot today. Just wanted to point out Ruby's feathers. She is crawling all over me as I type. She is taking an interest in the computer as we go. She went from my chest to the keyboard as I wrote about her. Back to the feathers. You can see the red ones in the center of the wing but to the right are feathers that are blue. She gets prettier every day. A second view as the feathers are starting to pop up other places as well. They look like they are being pushed through a drinking straw. Painful adolescence has a whole new meaning to me. So does the ugly duckling story. She spent quite a while just like this or sleeping on my stomach. Very curiously, the moment I switched from my football website to start writing about her she decided she needed to help. Or something. The picture just below will explain adequately I trust. There is no scientific reason for these two (Greengo and Ruby) to have tailfeathers tonight when they did not have any this afternoon. I think it was spite because I told Sally there wasn't a need for a camera tonight. "There won't be anything new". I guess they showed me. We are coming to a crossroads on Ruby. She is the oldest but her development has been slow. Her mom favored her brother and it stunted her. We don't know that she won't face a struggle if we don't take her. We have come to the conclusion though that Greengo will make a better pet. But Ruby sure does snuggle well and that's high on our list of good things. When you feed these critters you can see they are going through the same motions as when their parent regurgitates food for them in the wild. There was another that tried to steal Ruby's food while she was feeding (chuy) and I think it was patterning that you would see if they were eating regurgitated food. Maybe she was ceding dominance to Ruby or maybe I'm wrong and she was just hungry. These three have fed. They are Greengo, Ruby, and Sleepy. I must tell you that Sally insists on renaming them (almost daily) which is ok with me. Some of them have gone through about three names by now. My mom always told me that you can't change horses in mid stream so they aren't changing here. It's a matter that we agree we can disagree. The closest ones below just want to snuggle when they have been fed. The furthest one is the runt of the litter and he seems to not be quite ready yet. Think he will grow slowly like Ruby did. Ok with me. I wish I could capture the images that I see. My skills are limited but I keep playing with exposure, shadows, contrast etc and birds develop from the mass of the picture. I think when they are bigger it will be easier. All four here and it's fairly easy to see what I mean. Two want to just get closer and two seem to care very little.It is tough to keep from buying a second bird as a Christmas present for ourselves. Every day is more fun as these little guys develop personalities. Well the family of our little flock is returning tomorrow so I am going to close out this chapter of the story tonight. I think this picture shows something of how they have developed over the past week plus. I think Sally is going to want to go with Greengo who is the bird on the right. Ruby is the one he is nuzzling with and this is not strange or different. I think I find them together more than any of the others. I am all for making an offer on her but her Mommy may want to make other arrangements. Nearest the camera is Chuy who was named for her propensity to chew on the feeding pipette. Turns out she is going to be a redhead also. On the left is sleepy who is the runt of the litter but is starting to grow. Sally stuck a few names on him to incite that and she used Samson the longest. He is growing and suitably wary of haircuts. Now just in case you do not remember the original look, I will save you the trouble of scrolling. The picture below was taken on the first or second day. It is almost certainly sleepy laying down on the job and looking smaller than the other two. Really I cannot be 100% and that is just the point. If something pops up that I just have to share I'll do so. I probably won't publish on facebook (although that seems to be automatic for this story). Sally will just post something that tells you to look. I always knew that babies developed very quickly but not just how quickly till we documented it here. Hope you enjoyed it as much as we did. Feeding these kids was no sacrifice. Just fun. Hope you enjoyed the ride. Yes we do have a decision. Or maybe we don't. Dave and Anita returned today and asked us which one we wanted. We told them we wanted two. They set a price and we are all happy. Mostly the birds are happy. When we play with them if they start fussing we put them together and the fussing stops. I did this once before with dogs. Raised two sisters and it was the best of all circumstances. If we give them the right type of attention that should apply here as well. I intend to open a new blog with these two but I know this is just like baby pictures. I intend to post once or twice a week. I will take more pictures than that but for the two or three readers who have enjoyed this little trip I don't want to wear out their welcome. By the way. If this looks like fun to you I can tell you that you can buy one for $500. At a pet store they are about double that. Just email me and I will put you in touch with the people who have them. We became accidental Parrot Farmers (albeit eagerly) and were forced to make a hard choice. Which of these four very interesting birds was to become a family member.